So I know that strawberry season is over (sigh), but it’s 7 months until my wedding and all this wedding planning has got me thinking all things girly! Today I even found our florist and just put the down payment on our flowers (on a side note, no one warned me about how expensive flowers can be!). 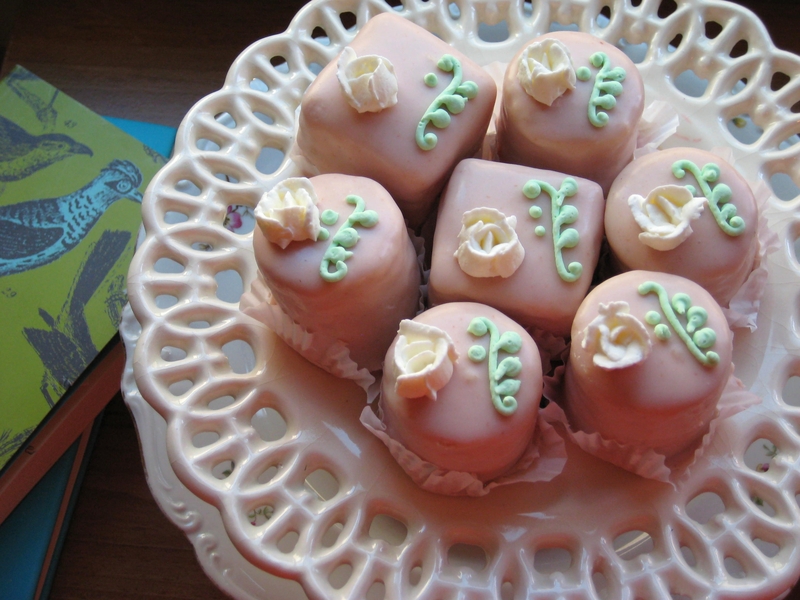 I wanted to make something very feminine, and what could be more feminine than petits fours? 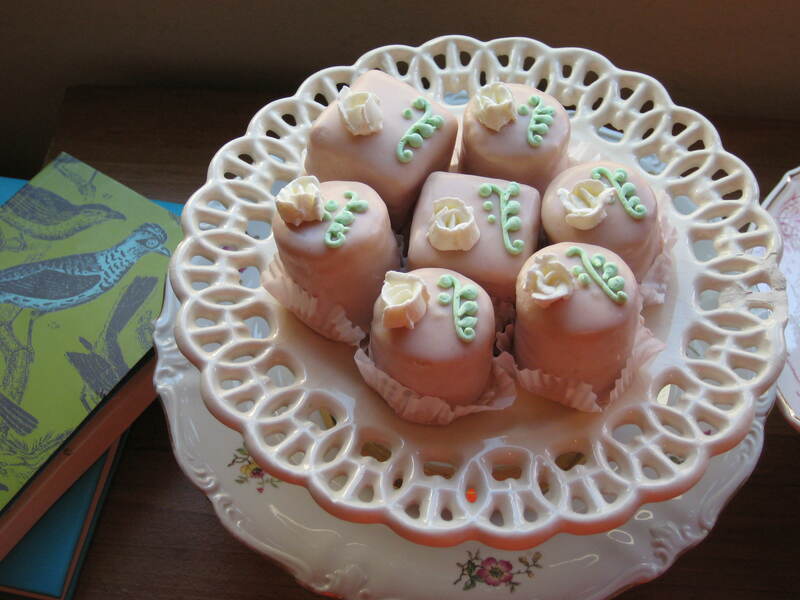 These dainty little cakes are filled with a strawberry and guava filling and then coated in a creamy and lightly fruity glaze. I wanted to use a glaze that contributed both to the texture and flavor rather than using your typical poured fondant, which is much too sweet for my liking. I love the pale dusty rose color, and the finished glaze actually reminds me of a strawberry milkshake, which I have no problem devouring if it comes with cake! While petits fours can be incredibly tedious (like any good dessert), if you have the time and the patience, I say go for it! The end result is extremely satisfying, not to mention delicious (trust me, I’ve already eaten… ahem, a few). Preheat oven to 325F. Sift together cake flour, salt, baking powder, and almond flour, set aside. In a bowl of a stand mixer fitted with a paddle attachment, cream together butter and sugar until very pale and fluffy. With mixer running on medium speed, slowly stream in vanilla extract and eggs until all liquids are incorporated, scraping bottom of bowl as needed. Turn mixer down to low, and slowly add in sifted dry ingredients, mixing just until all ingredients are combined. Spread out batter onto a greased sheet pan lined with parchment or wax paper. Bake 10-12 minutes, or until cake is golden brown and springs back when pressed in center. Let cake cool completely in pan and chill before assembly. In a small bowl, whisk together sugar and pectin, set aside. Using a small sauce pot, combine both purees and slowly bring to a simmer over a medium/low flame. Whisk in sugar pectin mixture, then bring mixture to a boil; filling should thicken slightly. Set aside 175 g of filling for the glaze, then cool the rest of the filling completely before assembling. Bloom together water and gelatin, set aside. In a medium-sized sauce pot, combine strawberry/guava filling, corn syrup, and cream. Gently heat over a medium/low flame, stirring with a rubber spatula to prevent scorching on the bottom. 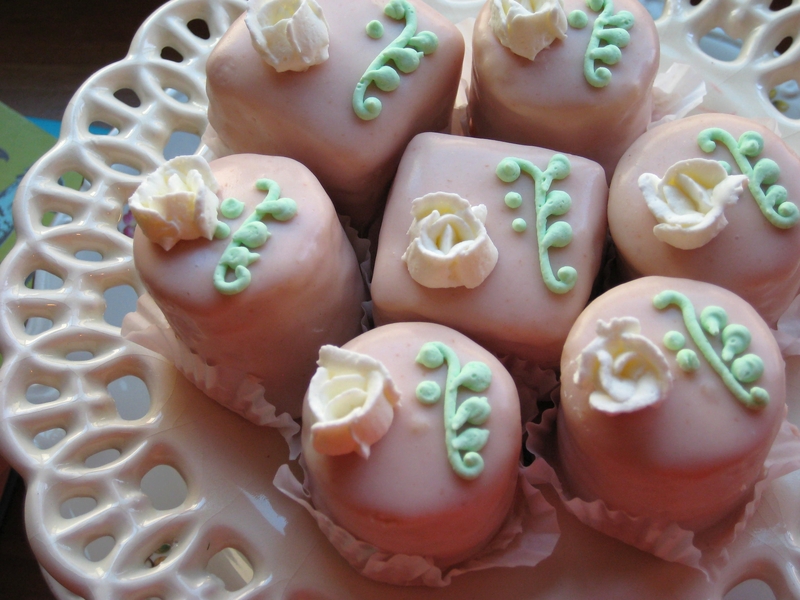 Stir in melted white chocolate, then add bloomed gelatin. Sir until gelatin is melted and all ingredients are completely combined. Cool to room temperature before glazing. Remove cake from pan and using a serrated knife, cut cake down the middle to get 2 pieces. Spread a thin layer of the strawberry guava filling evenly over one half of the cake, then turn the other half upside down and place on top of filling, pressing down lightly. I recommend keeping the cake in the freezer at this point until it is very firm, just so that cutting it later will be cleaner and easier. When cake is firm, use circle or square cookie cutters to cut out petits fours or use a serrated knife to cut out 1″ squares (make sure to clean cutters with hot water after each cut to maintain clean edges). Place cakes on a lined sheet pan with a wire rack on top. Slowly pour glaze over each cake, making sure that all sides of cakes are completely covered with glaze. I had enough glaze to coat each cake twice and get a nice even cover. Let glaze cool and firm up, then decorate cakes as desired; I piped mini rosettes and decor using regular Italian buttercream, but it’s entirely up to you!